Tension escalated in Hyderabad as communal clashes spread to new areas today, prompting the authorities to impose curfew in additional localities and issue shoot-at-sight orders to deal with rioters. Faced with acute criticism, including that the proposed blueprint of its flagship National Food Security Act (NFSA) was contempt of apex court’s directives on the issue, the UPA government may forward the draft Bill for vetting to Congress President Sonia Gandhi in her latest capacity as the chairperson of the National Advisory Council (NAC). External Affairs Minister SM Krishna today described as “shocking” the death sentence given to 17 Indians in the United Arab Emirates for killing a Pakistani and pledged to provide all legal assistance to them. The Commonwealth Games Organising Committee today virtually rejected the demand for making Amitabh Bachchan the brand ambassador for the prestigious event to be held here from October 3 to 14. A day after lid was blown off a racket in which the Sriganganagar police was allegedly involved in illegal sale of corpses, the state government today admitted that 15 such bodies were given to private medical colleges and hospitals without following proper legal procedure in the district. After suggesting that Jaya Bachchan should quit the Samajwadi Party and join him, expelled SP leader Amar Singh today rallied behind Amitabh Bachchan asking how the superstar can tell the country who is guilty for the Gujarat riots. Chief of the Indian Air Force, Air Chief Marshall PV Naik today took over as Chairman, Chief of Staffs Committee (COSC) of the Indian armed forces. He took over from General Deepak Kapoor, who retires tomorrow ending his six-month tenure as COSC. The ruling DMK today swept the bypoll for the Pennagaram Assembly constituency in Tamil Nadu held on March 27. The Himachal Pradesh government today rejected in the Supreme Court the Centre’s contention that the state’s claims over the Bhakra and Beas projects had been settled. The Supreme Court today allowed an advocate to withdraw his PIL in which he had sought a directive to the CBI not to allow Italian businessman Ottavio Quattrocchi, accused in the Bofors case, to operate his bank account. Almost a year after the 26/11 attacks case began in a special court here, the trial of Pakistani gunman Ajmal Kasab, accused of slaughtering 166 persons, and two Indians charged with taking part in the conspiracy is likely to conclude tomorrow. Tennis ace Sania Mirza, her parents and sister were today granted visa to travel to Pakistan for her marriage to Pakistani cricketer Shoaib Malik.Pakistan High Commission sources said Sania and her family had been given visas for the cities of Lahore, Sialkot and Karachi. As per arrangement between the two countries, India and Pakistan give visas for three cities to the visiting nationals of the other country. The indefinite curfew, imposed in 17 police station limits yesterday, was extended to eight other police station limits in the vulnerable old city following outbreak of violence. The rapid spread of group clashes, despite heavy police deployment, triggered fears of a political conspiracy to destabilise the Congress government. While an eerie silence prevailed in the curfew-bound areas, riots broke out in new localities, prompting the police to rush additional forces. As the Rosaiah government grappled with reports of possible internal sabotage to unseat the present dispensation by engineering riots, the incidents of group clashes and arson poured in from several areas. Rival groups fought pitched battles on the streets and pelted stones at each other, prompting the police to resort to baton-charge and use tear gas shells to control the situation. 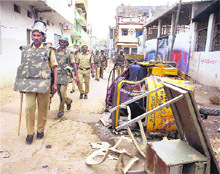 The incidents of rioting were reported from Musheerabad, Kavadiguda, Raniganj, Ramgopalpet, Secunderabad, Malakpet and Begum Bazaar. Trouble broke out in Musheerabad during a procession taken out by Bajrang Dal activists in connection with Hanuman Jayanti. Over 10 persons were injured in the clashes. A few hours later, similar group clash broke out during the Hanuman procession by the saffron outfit at the busy Begumbazar area. The police lobbed tear gas shells and fired in the air to quell the mob. In the curfew-bound Gulzar Houz and Shah-Ali-Banda areas, rioting broke out but the police swiftly brought the situation under control. “The situation is under control but there is no possibility of relaxing the curfew till Wednesday,” he said. As a precautionary measure, the police forced closure of shops and business establishments in several sensitive localities. So far, over 110 persons have been arrested in connection with communal clashes and special police teams formed to nab others. The current spell of communal trouble started on Saturday in Moosabowli area following a dispute over pitching religious flags. One person has been stabbed to death and over 80 injured while several places of worship have been attacked and vehicles torched during the clashes. Over 1,800 policemen including CRPF, Rapid Action Force and Central Industrial Security Force personnel have been deployed in the trouble-torn areas. Meanwhile, political blame game has begun as the ugly face of communal hatred has come back to haunt the IT-savvy city. While a section of the ruling Congress leaders from Telangana region saw conspiracy by their colleagues from coastal Andhra and Rayalaseema regions to scuttle the process of Telangana state formation, another section suspected that the riots could have been engineered by some vested political interests to destabilise the Rosaiah government. Even though an empowered group of ministers headed by Finance Minister Pranab Mukherjee has cleared the draft food security Bill, sources say the Congress president is also not too happy with the “diluted version” and would like a more radical law. She can now directly influence policy change after the government revived the NAC-II with her as its chairperson. The UPA coalition is under fire over issues such as fuel prices and with its core voters being predominantly rural and poor, the Congress hopes that the party’s poll promise, the NFSA, will help boost its fortunes ahead of Assembly elections in states like West Bengal, Bihar and Uttar Pradesh. Since the chair of the NAC holds the rank of a cabinet minister, it will allow the Congress president to work with government officials and documents on what is being termed as her pet project. Sonia is finalising the composition of the new team, which may be put in place soon, sources say, adding that the council members can be decided in the next few days so that the council can guide the government in giving boost to planned programmes, including the Food Bill. Two MPs are likely to be inducted and Union Ministers kept out of the new set up Though it not yet clear whether Rahul Gandhi will be a part of the team or devote to the party organisations fully. The Congress in general and Sonia in particular are very keen on two issues - Women’s Reservation Bill and the NFSA. While the Women Bill is embroiled in problems thanks to the Yadav trio of Lalu, Mulayam and Sharad, rights groups have now raised objections on the design of the NFSA, 2010, which makes 25kg of foodgrains at Rs 3 per kg a legal right of poor families. “We will give them consular assistance and we will also try to find out in what other ways we can help them out to file an appeal in the higher court,” Krishna told reporters here. The Indian Consulate General in Dubai has sought consular access to these Indians and as well as a copy of the judgment of Sharjah’s Shariah court that sentenced them. The men were accused of killing a Pakistani and injuring three others following a row over illegal alcohol business. Minister of Overseas Indian Affairs Vayalar Ravi said: “We’ll see that everything is done and an important lawyer, apart from financial assistance, are provided to the accused. Definitely, we will try to help these people who are in need of government help. “The death sentence is rather shocking. We have decided to give maximum possible help to them,” he said. "We are thinking of brand ambassadors from sports like Milkha Singh, P T Usha. We are thinking of young people," Organising Committee chairman Suresh Kalmadi told reporters when asked about the suggestion of BJP leader V K Malhotra that Bachchan be made the main brand ambassador of the event. Asked whether the organisers will make anybody from the Bollywood the brand ambassador, Kalmadi said nothing has been finalised yet. "Right now we have Shera, the mascot. We have not thought of the issue of making somebody brand ambassador," he said. Malhotra, who is the vice-president of Indian Olympic Association, had on Sunday written a letter to Kalmadi suggesting that Bachchan be appointed the main brand ambassador of the mega sporting event. Attacking the BJP for suggesting Bachchan's name as brand ambassador for the event, the Congress had yesterday said the party has a habit of "fishing in troubled waters". There has been bad blood between Congress and the actor, who was once a Congress MP and close to the Gandhis, and things came to a head after his presence in a Maharashtra government function in Mumbai last week. A section of Congress objected to his presence as the actor is a brand ambassador for BJP-ruled Gujarat. Asked about making Bachchan the brand ambassador for the Games, Chief Minister Sheila Dikshit said, "you ask Kalmadi or you ask V K Malhotra." Home Minister Shanti Dhariwal made this admission in the state Assembly after BJP MLA Om Birla raised the issue following allegations by a Sriganganagar-based jeweller Rajkumar Soni that the body of his 19-year-old son Rahul was sold to a medical college by police. However, Dhariwal said there was no proof to suggest that these bodies were sold to the private colleges. He told the Assembly that 15 bodies were handed over by the local police to the private medical colleges and hospitals in Srigangangar from 2006 to 2009 without following required legal procedure, but there was no evidence of “selling” of such bodies. According to him, a preliminary probe by the Additional SP, Sriganganagar, found that the unclaimed bodies were given away to the medical institutions, including those dealing with ayurveda and homeopathy, in violation of the Rajasthan Anatomy Act, 1986. He said the government has asked the Additional SP, Sriganganagar, to submit a detailed report within three days on disposal of unidentified and unclaimed bodies reported in the district in the last ten years. Seven police personnel, including four inspectors, have already been chargesheeted in departmental action, while six others, including five assistant sub-inspectors and a head constable, have been attached to police lines, besides being served a show-cause notice. The illegal trade in bodies came to the fore when Rajkumar Soni tried to get access to the body of his son who died under mysterious circumstances on May 26 last year. Addressing a press conference at the Pink City Press Club yesterday, Soni said his teenaged son was found in an unconscious state at a park in Sriganganagar on May 25 last year, after which the police admitted him in a local hospital. He claimed that Rahul’s BP was normal when he was admitted but was declared dead after undergoing treatment for 11 hours. “However, soon after conducting postmortem examination the police handed over his body to a medical college. They didn’t make any effort either to identify the body or to trace us. They declared the body as unclaimed and sold it to a private medical college,” he charged. When Rajkumar contacted the police, he was told that the body was consigned to flames. However, when he asked for the crematorium’s address so that he could collect the remains, the police told him that the body had been handed over to a local private college. “When we approached the college authorities they told us that they have applied a chemical worth Rs 16,000 on his body. They asked us to pay the amount for releasing the body,” he alleged. “After that I filed an RTI application which revealed that the police from 2005 to 2009 have given 29 bodies to two private medical colleges in violation of the Rajasthan Anatomy Act,” he said. Sharing the dais with Amitabh two days after he took a swipe at his wife for still remaining with the Mulayam Singh Yadav’s party, Amar Singh took on the Congress saying the Supreme Court would decide on the 2002 riots. He slammed the Bollywood star’s detractors for doubting his secular credentials. The coming together of Amitabh and Amar Singh assumed significance amid reports of a rift between the ex-SP leader and the Bachchan family. Amitabh faced the strongest ever criticism yet from the Congress yesterday for his association with Narendra Modi-ruled Gujarat as its brand ambassador. In a hard-hitting poser, the Congress dared him to tell the country as to who was responsible for the riots in Gujarat. “Amitabh’s secular credentials are beyond doubt as he carries on his father’s (Harivanshrai) legacy,” he said at a function of the Symbiosis Institute’s College of Mass Communication, about 40 km from here. Air Chief Marshall Naik will be the 11th COSC of the forces in less than 10 years since the system was started in October 2000. Lack continuity of the system was evident today when Naik made it clear while answering questions from the media “ ….it will take me a month to understand. Give me some time”. He will be in saddle till his retirement in July next. The COSC is appointed as per seniority among the three serving chiefs of the Army, the Navy and the IAF. Senior officers have often questioned the logic of posting officers for such short tenures as they would not be able to make any worthwhile impact on national policy making. The most striking case was of Gen NC Vig who was COSC only for a month in January 2005. Air Vice Marshall S. Krishnaswami had a tenure of five months starting August 2004 while General JJ Singh was the COSC for only six months starting April 2007. Not all service chiefs go on to become COSC. The last IAF chief Air Chief Marshall Fali Homi Major never got a chance and the new Army Chief General VK Singh is also not slated to be the COSC. In contrast, senior officials among the civil services like the Cabinet secretary, Home Secretary and the Defence Secretary have a fixed tenure of two years. In the aftermath of the 1999 Kargil conflict, the government took the step to appoint a COSC. Actually the Kargil Review Committee and the subsequent Group of Ministers report in 2001 on reforming the national security system had stressed the need for a Chief of Defence Staff (CDS) - who will be senior to the chiefs -- to provide single-point military advice to the government and manage the country's nuclear arsenal. Naik today pointed out that there were several models of the CDS operating in different countries and said, "we don't know which model suits us the best. Once we decide that, I am sure the CDS will come in." Another former COSC, Admiral Sureesh Mehta had recommended during his tenure that all service chiefs should be brought into the nuclear command authority. At present, only the COSC is in the authority and with such short tenures, he barely gets time to understand the structure. The outgoing COSC General Deepak Kapoor today said “It was for the government to take a decision (on including all chiefs)”. However, Opposition AIADMK suffered a severe jolt, as its candidate was pushed to the third position behind the PMK, a party of the backward Vanniyar community. DMK candidate P Inbasekaran polled 77,637 votes and defeated his nearest PMK rival GKM Thamizh Kumaran who garnered 41,285 votes. AIADMK candidate R Anbazhagan secured only 26,784 votes, just managing to retain his security deposit by a whisker. Despite the support of Vaiko’s MDMK and Left parties, the AIADMK secured only 15.68 per cent votes, compared to its share of over 31 per cent votes in the same constituency in the 2006 Assembly elections. The PMK, which got 24.17 per cent votes, had contested on its own. The AIADMK, which dominated the state politics ever since its inception in 1972 by matinee idol MGR, had been in power for more than two decades. It managed to retain the second Opposition even when it faced a string of defeats, starting from the 2004 Lok Sabha poll debacle. As soon as the results were declared, gloom descended on the AIADMK camp as party cadres, who had never seen their party slip to the third place, attempted suicides at many places. Arguing for the state, senior counsel JS Attri and AK Ganguly said the Centre had only made an ad hoc arrangement for the limited purpose of apportioning the assets and liabilities of the Punjab State Electricity Board (PSEB) of undivided Punjab to Himachal Pradesh and Haryana. Appearing before a Bench comprising Justices RV Raveendran and RM Lodha, Additional Solicitor General Mohan Jain said the Centre had filed an affidavit in the court, maintaining that the BBMB issue was settled between the contending parties and as such this could not be reopened. Similarly, the claims over the Beas project were also settled 15 years ago, but if the court wanted this matter to be reviewed it could be done, the ASG said. Ganguly and Attri, however, said Himachal Pradesh was getting only 2.5 per cent of free power from the Bhakra project and 15 MW from the Beas project against the state’s claim of 12 per cent free power on the basis of the projects being located in the state and another 7.19 per cent on the basis of the population transferred following the reorganisation of Punjab. Several letters by the Centre and HP clearly showed that the existing arrangement was only temporary. The state was facing a lot of problems on the development front as the mountain terrain was not conducive to setting up of industries and even hydro power plants had to be small in order to maintain the bio-diversity, Ganguly said. The arguments would continue tomorrow. The SC also asked him to file a fresh petition for taking other action against the accused. Bench headed by Chief Justice KG Balakrishnan advised the petitioner, Ajay Agrawal, to withdraw the PIL as it had become infructuous after India had allowed the London bank account to be operated again by Quattrocchi for lack of evidence against him. Agrawal, however, argued that bank account was not the only issue and the CBI was anxious to close the entire case against Quattrocchi. The Bench, which included Justices Deepak Verma and BS Chauhan, said he could file a fresh petition with the court for the purpose. The CBI has filed an application with the Chief Metropolitan Magistrate court here seeking permission for closing the case against Quattrocchi. The matter is listed for hearing tomorrow. The arguments by prosecution and defence are expected to conclude tomorrow following which Judge ML Tahaliyani may announce the date for the verdict, Special Public Prosecutor Ujjwal Nikam told PTI today. The prosecution examined as many as 653 witnesses to prove their case that Pakistan-based Lashkar-e-Toiba (LeT) carried out the dastardly attacks in Mumbai by sending 10 jehadi terrorists from Karachi. The court also examined four witnesses, including two National Security Guard (NSG) commandos, who led the teams in operations to fight the terrorists. The police filed charge sheet on February 26 last year and the case was committed from magistrate’s court to a sessions court on March 9, 2009. On April 17, Kasab had pleaded that he was a juvenile, but the court rejected his claim after examining prosecution witnesses and experts and ruled that he was above 20 years. On May 8, the first witness stepped into the box, saying he had seen Kasab gunning down sub-inspector Tukaram Ombale at Girgaum Chowpatty. After examining 653 witnesses, including 30 eye witnesses, Nikam opened arguments this month, saying there was evidence to suggest that the security apparatus of Pakistan was involved in the attacks on India’s financial nerve centre. Some days later, American terror accused David Headley, in a plea bargain before a Chicago Court, disclosed that Pakistani army men were behind the conspiracy to strike terror in Mumbai in November 2008. Submitted this morning, the visa applications of the Mirza family were processed on a priority basis by the high commission to facilitate their travel. Usually, it takes days and at times even months to secure a visa for Pakistan. Reports from Pakistan suggested that Shoaib’s family had also applied for Indian visas.